MAIDUGURI, Nigeria -- Two female suicide bombers blew themselves up in a northeast Nigerian refugee camp, killing at least 56 people, health and rescue officials said Wednesday. A third woman bomber was arrested and has given officials information about other planned bombings that helped them increase security at the camp, said an official of the Borno State Emergency Management Agency. Some 78 people are being treated for wounds from the twin explosions that occurred Tuesday morning in a camp of some 50,000 people driven from their homes by the Boko Haram Islamic uprising, according to health workers in Maiduguri, the biggest city in northeastern Nigeria and birthplace of Boko Haram. They spoke on condition of anonymity as did rescue officials who said they were not authorized to speak to reporters. The emergency management official said 51 bodies were buried Wednesday in Dikwa, the scene of the carnage 85 kilometers (53 miles) northeast of Maiduguri. Health workers said five bodies were brought to the main hospital in Maiduguri. The officials said poor cell phone service delayed news of the attack. 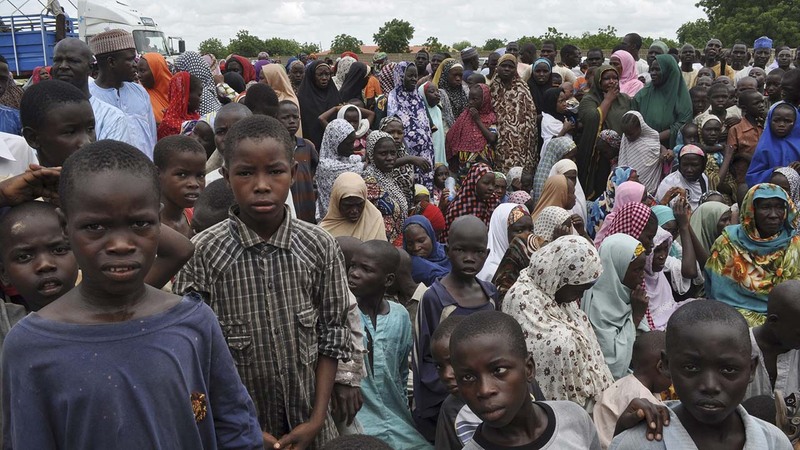 Boko Haram's 6-year-old Islamic insurgency has killed 20,000 people, made 2.5 million homeless and spread across Nigeria's borders. Gov. Midjiyawa Bakari of neighboring Cameroon's Far North province said two suicide bombers believed to have come from Nigeria on Wednesday killed 10 people and injured 40 attending a wake in a border village, including children. Attacks in Chad and Niger also are blamed on Boko Haram. Since troops from Nigeria, Chad and Cameroon last year drove the Islamic extremists from towns and villages where they had announced an Islamic caliphate and ruled with their strict interpretation of Islamic law, the insurgents have taken to attacking soft targets such as mosques and market places where many people gather.